It’s Saturday! I’m excited for the weekend but if you’re like me, the weekend means cheat days because it’s all about family and friends. Two-three days packed of late nights, early mornings (because my body only wants to sleep in when it’s a work day) and bad food. So, I have to get my Janathon day 10 activities in early otherwise I might not do anything! I may have jinxed myself yesterday because after blogging my right leg started feeling really uncomfortable. It’s kind of in my hip or in my joints, I can’t really explain the pain. All I know is it hurt any time I moved my leg in bed or even in certain positions. This is why I decided to do yoga today as I’m still in a bit of discomfort. I tried the Recovery Yoga for Runners from Runners World. Boy, I am not a fan of Yoga. Whenever she had her leg straight up I felt like I had mine the same way, then I looked in the mirror and I was lucky if I was even at a 90 degree angle… Same with getting your head to the floor, my forehead was probably still two feet from the ground. I tried my best and didn’t do any of my other leg exercises like lunges or squats today. Well, I hope it helped! After yoga I did 5 intervals of 30 seconds with 10 second rests of arm exercises using 10 lb weights: rows (left arm, then right), bench press, shoulder press, and something I call butterflies but have no idea what they really are…. 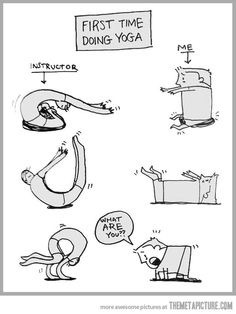 I may have done a yoga before but I am definitely not flexible. The problem with doing yoga is you want to look like the ideal, but the ideal isn’t always ideal for you! It really doesn’t matter and often if you get yourself looking like you think you should, you’re just ‘making shapes’ and not actually getting the benefit. It’s taken me a long time on the mat to really get this!